Fans who follow Strange Music’s Prozak on Twitter may be familiar with the emcee’s extremely nocturnal schedule. Up at all hours of the night, Prozak encourages his fans to stay up with him on Twitter and interacts with what he’s labeled #TeamInsomnia. Recently, Prozak hit the lab with Krizz Kaliko to record new music, but it was a hilarious photo of a passed out Krizz Kaliko that had fans buzzing on Twitter. Tagged with #TeamInsomnia, Prozak shared the photo with his fellow insomniacs and proved that no one is safe. When will #TeamInsomnia strike again? Stay tuned for more! Don’t forget to catch Prozak live on Tech N9ne’s “Hostile Takeover 2012” Tour! 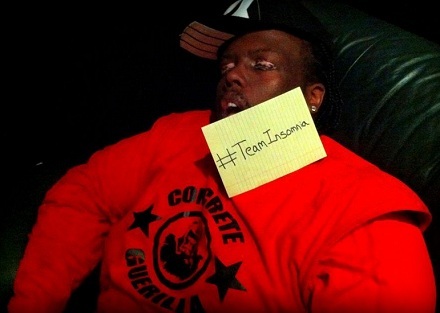 Are you a member of #TeamInsomnia? Who do you think will get it next?